Pickup lines are quite popular nowadays may be because of its uniqueness and spontaneity. It is more popular most especially to the new generation. 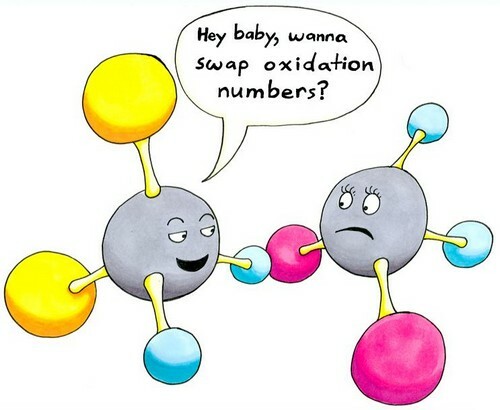 So, are you looking for some cool and one of kind chemistry pickup lines? 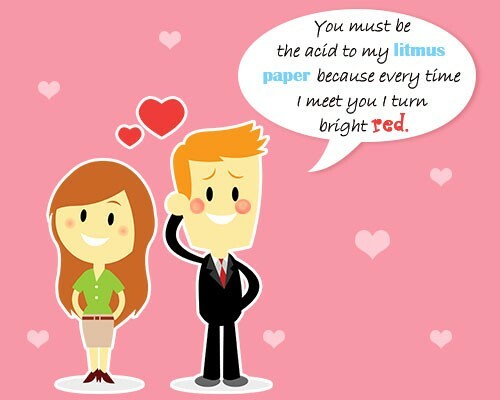 We have an assortment of chemistry pickup lines which will surely entertain you as you browse through our list. We guarantee you that you will not bore while reading this! Enjoy and feel free to share. Students of the chemistry are fond of doing it on the table periodically. Trust me. Are you aware that you are like an exothermic kind of reaction? Because you tend to spread your hotness all over the place. Do you happen to have eleven numbers of protons? Because you are sodium well. If I will be an enzyme, I will choose to become a DNA helicase so that I will have the ability to unzip your gorgeous genes. You must be made from copper and tellurium. Why? Because you are so awesomely CuTe. You are like my appendix because you are giving me this need. This need to take you out. Each and every second, billions of neutrinos make a way into you. Would you like me to join in? My attraction towards you is so strong; I believe that the scientist should develop an additional fifth fundamental force. You are the reason that I keep on having rapid stem elongation. Are you an auxin? 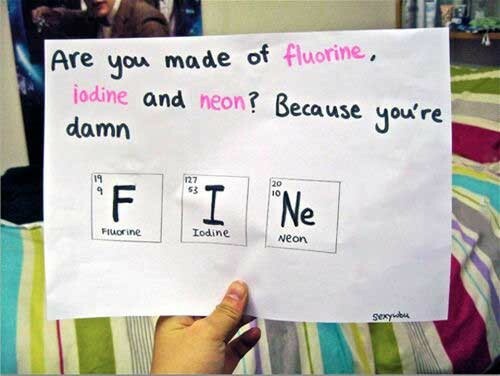 Lady, I think you are made of Florine, Iodine and Neon. Why? Oh, because you are so FINe. Are you calcium bicarbonate? Because I want to make you wet so we will have an explosive and fiery reaction. I wish that you were made with copper. Because I want to Cu having a relationship with me. If I am adenine then I will have this chance to be paired with U. My bond length does not matter because no matter how short it is I can still give you lots of electron density. Want to find out our combined volume? We will do it using the process of displacing the water in my water bed. You are just a full BaBe. Are you a compound of barium and beryllium? Oh baby, you are so hot that you put the nuclear reactors to shame. Your smile is very contagious that you make my zygomaticus muscles contract too. Hey lady, are you a neuron? Why? Because you got this potential action. If you are a chloroplast then it will be good if you will be on my stem. Girl, do you want to put into test the spring constant on my newly bought mattress? Your history may be a total failure but our chemistry together has a bright future. 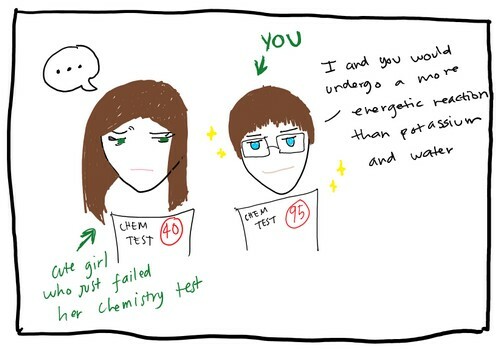 We both know that we have an awesome chemistry. How about we do a little biology? You are the reason why I can suddenly transform into a diamond. Every time I see you, I get hardened to 10. Gorgeous, you really have this potential. Do you want to go in my place so we can convert it to kinetic energy? Whenever we are in each other’s arms, it is comparable to superposition of two awesome waves in phase. You are the much needed HCI to my NaOh. You are meant to be with me, baby. Is it the weather today? Or it is just the forming of our bond? Because it is getting intensely hot in here. Oh babe, what a perfect cleavage. You must be definitely made of mica rock. Are you related to Alfred Nobel or not? Because sweetie you are a dynamite gal! Do you want to hang out with me? I will excite your natural frequency baby! Let us do something useful. How about we measure the number of static friction as we rub on each other’s skin? Know this fact honey, the length of the vector does not count. It is how you apply the force that matters the most. If I am to become an endoplasmic reticulum, do you want be to be smoothly smooth or roughly rough? I want to be an Ion so that I will get to form and exothermic bond with you gorgeous. My right leg will serve as the cell wall and my left leg will be the membrane, are you willing to be the cytoplasm? Honey, please bring your beaker and I will be bringing my stirring rod. Let us heat up some fun! I just know that we have a good coefficient of friction. Want to test it? Let us play a game, you will be the fluorine and I will be the francium. Sooner or later I will give you an electron. This sudden cardiac arrhythmia wants to tell you how much I love you. Oh dynamite, you are my polarizing all my bonds. Are you chlorine? That beautifully crafted dress looks so good on you but it would look so much better decelerating towards my bedroom floor at 8.8 m/s/s. You are as so sweet! Sweet as glucose! I will still for you darling even if the gravity on earth will be gone. You are the Oxygen and Neon combined that I have been waiting all this time. You are most definitely the One. How come we have this strong attraction towards each other? I must be the North Pole and you must be the South. 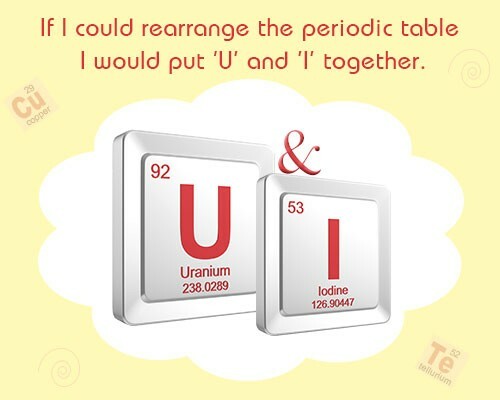 I want to rearrange the periodic table of elements sop that I can put Uranium (U) and Iodine (I) right next to each other. Let us find out the friction between us while I stay on the top and you will be at the bottom. Be sure that got your evaporative cooling because sweetie I will make you sweat a lot! I might look like a nerd but I am not a Bohr in making love. Honey you are the reason why the electrons in my body have positive charge. Baby, you put the hotness of the Bunsen burner to shame. Want to make uranium iodide? Okay, let us stick together U and I.
Sweetie, do you want to sample my DNA tonight? Want to work out babe? How about we work out our orbicularis oris muscles, you and me together? I want to date you just like how scientist wants to date a carbon sample. Your bacterial signature is what I admire the most. Honey, let us take the numbers of the amplitude of our rhythmic physical wave. You are the sole reason why my roots keep on extending. I guess it is seeking you. Are you a start codon honey? Because you are really turning me on. I want to dig you just like how the archeologists want to dig up dinosaur bones. How about we do each other on the table? Periodically. You are one hot gal that you are melting my proteins. Are you willing to do some energy-draining quantum tunneling tonight? With me? Sugar, are you a concentration gradient? Because I really want to go down with you. The sight of you alone makes me undergo an anaerobic respiration. You are taking literally my breath away. 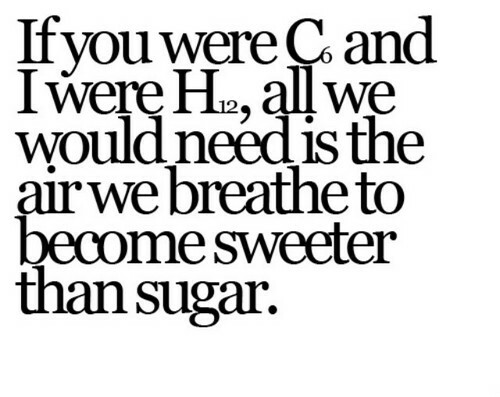 You must be C6 and I must be H12 because we are sweet as the sugar on the table. Are you some kind of a magnet? Because you are attracting me so much like how nails attaches themselves to the magnet. Do you wish to play with my stick and balls? Here, I just bought the newest molecular model kit. You must be a fully charged atom. Why? Because I got my ion you. I will be the battery while you will be the aluminum foil. Together, let us light up this world. Pay no attention to hydrogen because for me, you are my first element. If you are not a scientist, then how come I lab you? You are comparable to the proton inside my core. Because without you, I will never be the same. You and me, let us form a synapse and let us exchange neurotransmitters as well. You are like a moving electric charge while I am a moving magnetic charge. Do you wish to flux with me? If I will make you an element, you will be the Francium. Because you are the most attractive of all. I can stimulate your entire sensory system even without using neurons. You are the only reason why my boiling point keeps on getting higher. 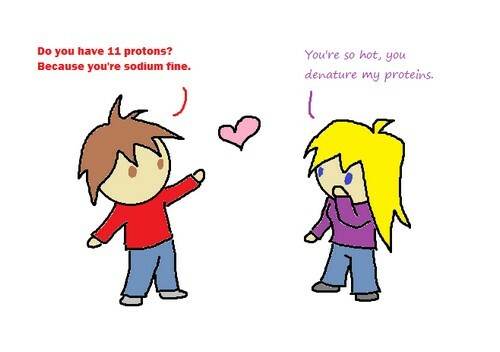 Honey, will you be my enzyme? Because I am in desperate need for some chemical reaction. Will you please palmitoylate my proteins, so I can drive hardly it into your lipid raft. Can I have the chance to be the phasor to your electron so that I can take you to an excited state? Are you some sort of gibberellins? Because I’m currently experiencing some stem elongation and hardening. You are the reason why my anoxic sediments are dying to increase their redox potential. I need more alcohol so that my reaction for you will be catalyzed. Potassium and water combined will have an energetic reaction. But you and I combined will have a much better energetic reaction. Just like an alkali metal towards oxygen, I want to get in you so I can explode. Just like the sticky ends of recombinant DNA, we perfectly fit together. You must be an alpha carbon. Why? Because you look vulnerable for a backside attack. You need to share your hotness with me sweetie. That is stated in the second law of thermodynamics. Let us make a mess together because I just hired some lysosomes to clean up after us. Because of you pretty, my hypothalamus is secreting serotonin. It makes me want you. You lady, are giving me more jolt than two mitochondria combined. You are just like the photon quanta to my valence electron. Why? Because you electrify me to the highest energy level. You darling, is making me way hotter than sulfur hydroxide mixed with ethyl acetate.